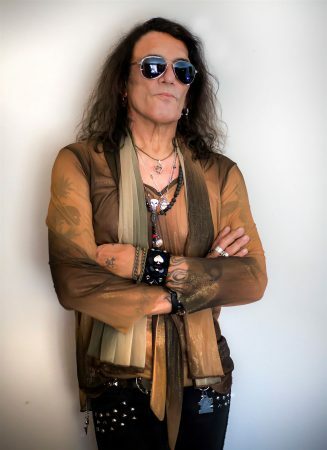 View To A Thrill, the latest solo disc from RATT rocker Stephen Pearcy, is a virtual tour de force of 80s-style hard rock hooks. From the frenetic opener “U Only Live Twice” to the infectious “Sky Falling,” an Out Of The Cellar-era-sounding powerhouse (think “In Your Direction” with a splash of “Wanted Man“), all the way to the funky groove-laden closer “Violator,” the album succeeds in its quest to take the listener back to the decade known for its unabashed sonic decadence. Standout track “Not Killin’ Me,” a throwback to later-period RATT such as 1990’s “One Step Away,” slows down the frantic pace nicely before the one-two punch of “Dangerous Thing” and the appropriately-titled “I’m A Ratt” resumes the welcome assault on the senses. While technically a solitary endeavor, Pearcy’s backing band deserves a heaping amount of credit as well, particularly co-writer Erik Ferentinos, who effortlessly handled all guitar duties, including both lead and rhythm. Although Warren DeMartini is impossible to duplicate, Ferentinos’ work is nearly flawless and will undoubtedly satisfy those seeking raucous rapid-fire RATT riffs. Matt Thorne (bass) and Scot Coogan (drums) round out the meticulously-crafted supporting players, providing stellar work. The four-piece outfit benefits the album’s ferocity greatly, as it decisively tightens the record’s sound and gives it a stripped-down, austere feel. Clocking in at just over 33 minutes, View To A Thrill is a filler-free, roller coaster of pure RATT ‘N ROLL. Give it a listen or two and you’ll surely concur that it deserves its place in your rockin’ rodent collection next to classics like Invasion Of Your Privacy, Reach For The Sky, and Dancing Undercover. Click here to purchase View To A Thrill.